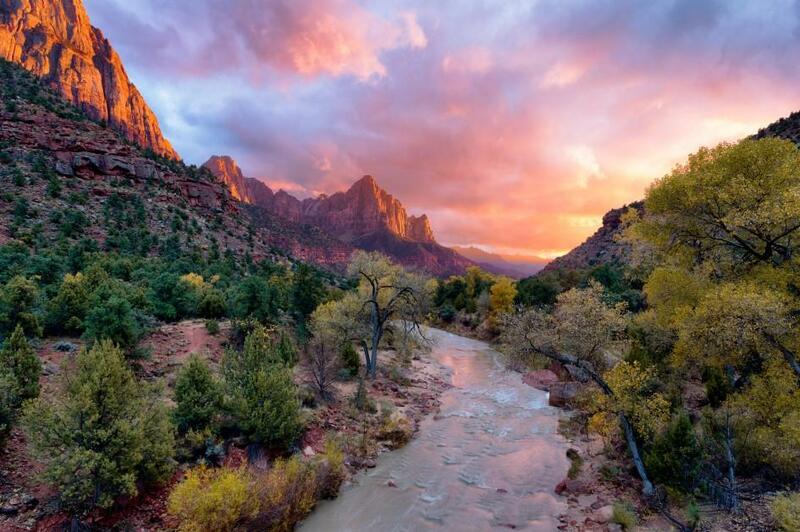 Zion National Park is located within the state of Utah in southwestern United States. The park was established on November 19, 1919. It covers an area of 593 square kilometers (229 square miles). The lowest elevation is 1,117 meters (3,666 feet) at Coalpits Wash and the highest elevation is 2,660 meters (8,726 feet ) at Horse Ranch Mountain. Zion’s diverse topography leads to a diversity of habitats and species. The first people to exist in the Zion National Park area are believed to have hunted camel, giant sloth and mammoth approximately 12,000 years ago. They tracked the animals in the region but when the animals died out about 8,000 years ago the way of life changed. Zion National Park includes mountains, canyons, buttes, mesas, monoliths, rivers, slot canyons, and natural arches. A million years of flowing water has cut through the red and white beds of Navajo sandstone that form the sheer walls of Zion. Zion Canyon is the park’s main attraction. Zion National Park is home to a variety of wildlife species including 29 reptile species, 9 fish species, 207 bird species, 67 mammal species, and 7 amphibian species. Zion Canyon is 24 kilometers (15 miles) long and up to 910 meters (3,000 feet) deep. The beginning of the canyon is usually delineated as the Temple of Sinawava (“Sinawava” refers to the Coyote God of the Paiute Indians), a vertical-walled natural amphitheater nearly 910 meters (3,000 feet) deep. Animals that are found in Zion National Park include gray foxes, ring-tail cats, coyotes, badgers, cougars, bobcats, cottontails, jackrabbits, mule deer, and kangaroo rats. At the Temple the canyon narrows and a 30 centimeters (1 foot) trail continues to the mouth of the Zion Narrows, a gorge as narrow as 6 meters (20 feet) wide and up to 610 meters (2,000 feet) tall. Birds that can be seen in Zion National Park include peregrine falcons, red-tailed hawks, golden eagles, California condors, white-throated swifts, and many others. Unlike the Grand Canyon where you stand on the rim and look out, Zion Canyon is usually viewed from the bottom looking up. Other popular attractions in the park include the Great White Throne, Angel’s Landing and the Watchman. The Great White Throne is a mountain of white Navajo Sandstone.The north face rises 720 meters (2,350 feet) in 460 meters (1,500 feet) from the floor of Zion Canyon.It is often used as a symbol of Zion National Park. There are 19 bat species living in the Zion National Park area. Angels Landing, known earlier as the Temple of Aeolus, is a 454 meters (1,488-foot) tall rock formation. A trail, cut into solid rock in 1926, leads to the top of Angels Landing and provides a spectacular view of Zion Canyon. There are over 1000 different plant species found in Zion National Park. The Watchman is the beautiful and often photographed formation guarding the south entrance to Zion. In the desert regions of Zion National Park plants such as sagebrush, rabbitbrush, Indian paintbrush, and prickly pear cactus are commonly found. Among the many arches in Zion, two stand out: Crawford Arch and Kolob Arch. Crawford Arch is the most visible, clinging to the base of Bridge Mountain 300 meters (1,000 feet) above the canyon floor. Zion National Park is popular with rock climbers. Some of the shorter walls include Prodigal Son, Spaceshot, Moonlight Buttress, and Touchstone. Located deep in the backcountry of Zion National Park’s Kolob Canyons District, and hidden in a small side canyon, sits Kolob Arch. The Natural Arch and Bridge Society considers Kolob Arch to be the second longest natural arch in the world. In 2006, the Society measured the span at 87.6 meters (287.4 feet), which is slightly shorter than the Landscape Arch in Arches National Park. Zion National Park's most popular hiking trails include Canyon Overlook, Emerald Pool Lower, The Narrows, Angels Landing, and The Subway. Tourists must be careful of weather warnings and flashfloods, which can occur when it rains. The park has a Subway, but it’s not a form of public transportation. The journey through Zion’s The Subway is like no other. Without any trails, hiking The Subway requires route finding, rappelling and even swimming. To explore the Subway, visitors must get permits, and it is subjected to daily limits. Visitors to Zion National Park can camp, go horsebackriding, hike, rock climb, sightsee, swim, ATV, and canyoneer. Zion is home to 68 species of mammal, ranging from the petite kangaroo rat to the sturdy, surefooted bighorn sheep. The most frequent mammal sightings are mule deer, foxes, bats, bighorn sheep, and squirrels. The highest elevation at Zion National Park is approximately 8,726 feet at Horse Ranch Mountain. Also there are approximately 29 species of reptiles, 7 species of amphibians, 9 species of fish, and 289 species of birds. Endangered California condors soar above the cliffs of Zion; threatened Mexican spotted owls – Zion has the highest density of these owls breeding in the state – live and raise their young in Zion’s narrow canyons. The lowest elevation at Zion National Park is approximately 3,666 feet at Coal Pits Wash. There is more than a 1,000 species of plants. The park has four life zones: desert, riparian, woodland, and coniferous forest. Zion National Park was Originally Named Mukuntuweap National Monument. It is believed that the landscape formations of Zion National Park formed about 250 million years ago. At one point Zion was a shallow sea-covered area, and possibly had the largest desert on earth at the time. In 1918, however, the acting director of the newly created National Park Service changed the park’s name to Zion, the name used by the Mormons. In 1920, Zion National Park had 3,692 visitors. In 2014, the park had 3.2 million visitors. There is a tunnel that cuts through Zion running 1.1 miles in length that was created in 1930 to make the park accessible to visitors. Prior to this it was extremely difficult for visitors to reach the park because of the landscape and limited roads. The tunnel is called Zion-Mt. Carmel Highway and Tunnel. The park is open all through the year, but the best time to visit is from April to October. The fall and mild spring temperatures are perfect for hiking. You can see splendid waterfalls and outstanding clouds during summer rains. The color of rocks looks radiant with winter snows, beautiful deep-blue sky, and summer foliage. The lowest recorded temperature in the park was -29°C (-20°F) in 1989, and the highest recorded temperature was 40°C (104°F) in 1985. Human use of the Zion National Park landscape dates back to at least 6,000 B.C. There are several petroglyphs sites in the park, but few are made public due to past, possible and future, vandalism.